Rohingya refugee Shah Miya stands where part of his shelter used to be before it was destroyed in a landslide. The steep, sandy hills in Bangladesh's Rohingya refugee camps are covered in black plastic to keep them from eroding away in the intense monsoon rains. Rohingya refugee Shah Miya digs at the sand that inundated his shelter. Despite the threat of more landslides, he says he doesn't want to move. 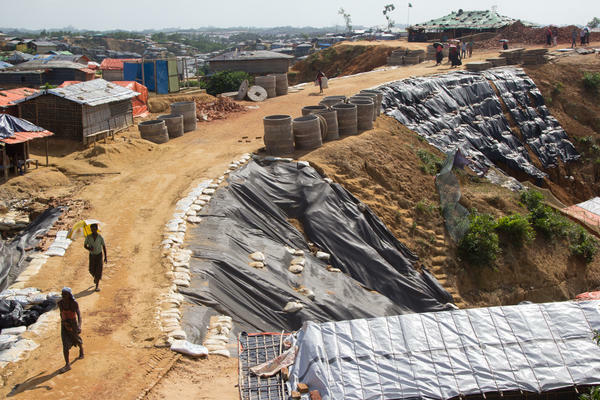 Black plastic sheeting and sandbags shore up a road through the Balukhali Rohingya refugee camp. The sandy soil is highly prone to erosion and has been washing away in the monsoon rains. Workers carry bamboo poles past newly constructed shelters at the Camp 4 Extension. 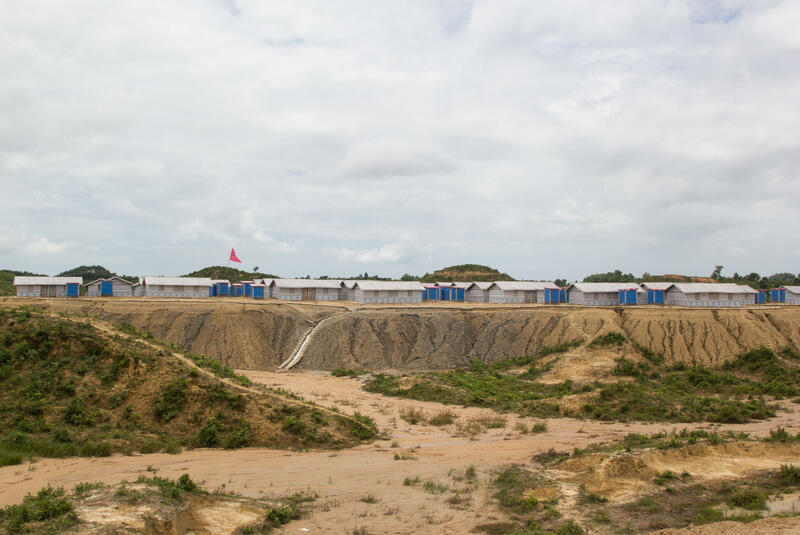 The U.N. refugee agency is moving Rohingya refugees to this new area to get them away from hazardous conditions in the old camps. 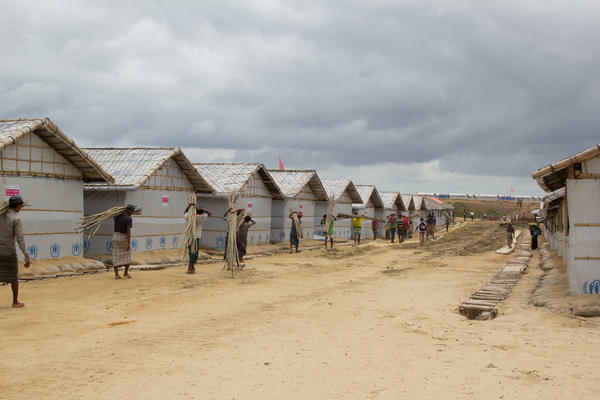 New refugee shelters are built on leveled ground in the Camp 4 Extension. Rohingya refugee Roshedha Begum, 40, holds up a photo of her son's dead body. 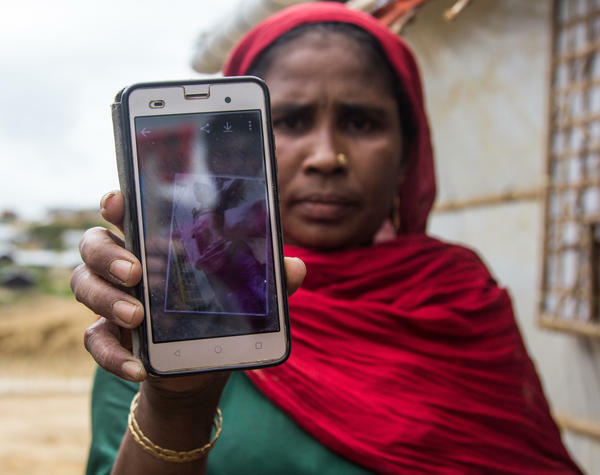 He was killed, she says, by Myanmar soldiers during the violence last year that drove more than 700,000 Rohingya into Bangladesh. In the sprawling Balukhahli refugee camp near the Bangladeshi resort town of Cox's Bazar, 52-year-old Shah Miya lives with two of his daughters and four of their children in a makeshift shelter on a steep, sandy hillside. But in a recent monsoon downpour, he says, the hill behind his shelter collapsed late at night. "I didn't know it would collapse," Miya says. "Then I heard a big noise. It was like, boom! And then it fell down." The landslide covered half the family's shelter in several feet of wet, brown sand. Fortunately, he says, no one was injured. One of the greatest threats facing Rohingya refugees in the huge camps in Bangladesh is the land itself. As the refugees have built their shelters, they've also stripped away almost all the hillside vegetation, making the sandy cliffs prone to collapse. In this year's monsoon season, thousands of shelters like Miya's have been damaged or destroyed and dozens of people have been injured. Early in the monsoon season, one child was even killed in a landslide. This week marks the one-year anniversary of the start of a massive exodus of Rohingya Muslims from Myanmar. Nearly 700,000 Rohingya fled attacks by Myanmar soldiers and pro-government militias, in what the U.S. and the U.N. have labeled a campaign of ethnic cleansing. Myanmar says it was an operation targeting Rohingya militants who'd attacked government police stations and army posts. 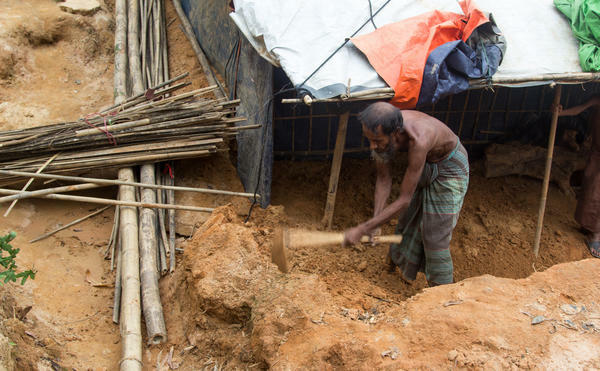 Once refugees arrived in Bangladesh, they hastily erected shelters with bamboo and plastic sheeting in the hills outside Cox's Bazar. The shelters are jammed so close together that often there isn't even enough room to walk between them. Miya says when he arrived 11 months ago, the only space he could find was on a ledge, with a steep cliff rising on one side and a precipitous drop on the other. "Back in Myanmar, I had a strong house," he says — a house made of wood, nothing like what he and his daughters and grandchildren share now, with the sand and mud and walls made of flimsy sheeting. Like most of the refugees, the family cooks over open fires. But in the monsoon rains of recent months, getting dry firewood can be almost impossible. "We have wet fire wood, a wet stove, everything is wet," Miya's daughter, Dilarah, says. "That's why it is harder to cook here, especially in the monsoon." Despite the difficult living conditions and the precarious location of their shelter, Miya says he plans to rebuild in exactly this same spot. He's clearing the ledge with a hoe and digging out the bamboo poles that were buried in the landslide. This camp is so crowded already that he says there's no other place to build a shelter nearby. In this spot, he knows his neighbors. Two of his grandchildren attend a nearby school for two hours a day. "With those children, where would I go?" he asks. "That's why I prefer to stay here." 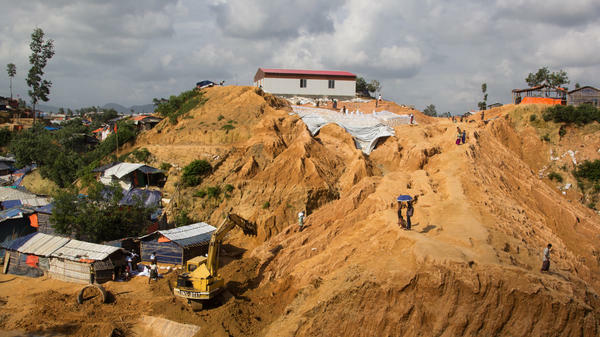 Aid groups have launched massive campaigns to try to prevent catastrophic landslides at the camps. They've dug drainage canals and ditches. They've sandbagged unstable cliffs. They've also spread plastic sheeting and tarpaulins over entire hillsides to keep them from eroding and falling on the refugee shelters below. Despite their efforts, thousands of shelters and other structures in the camps have collapsed. One neighborhood leader in the Balukhali camp says residents have rebuilt a mosque three times after it was repeatedly submerged under crumbling sand. 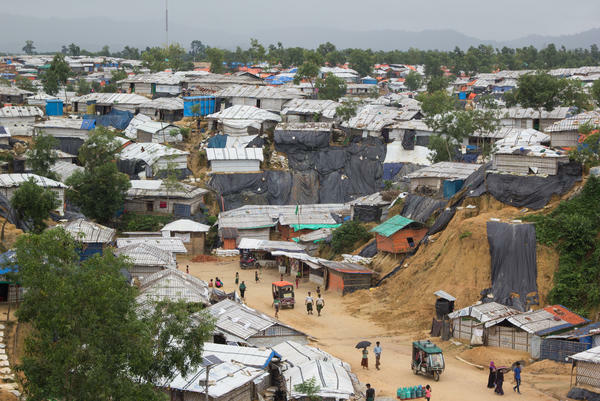 Aid groups led by the U.N. refugee agency have been trying to create safer, more stable settlements for the Rohingya. The only place to do that is on the very edges of what has now become the largest refugee camp in the world. In an area known as the Camp 4 Extension, aid agencies are using bulldozers to flatten the hills. Workers are building long rows of identical, white-walled shelters. Since March, more than 40,000 people have been relocated to planned settlements like the Camp 4 Extension. "We are bringing people from landslide risk areas, from flood-affected areas, from construction sites," says Sarah Jabin, an assistant field officer with the U.N. refugee agency. But even when the refugees are living in dangerous, difficult locations, she says, most of them don't want to move. Many of the Rohingya settled next to people they already knew from their villages back in Myanmar. They don't want to get moved miles away and lose those social bonds. 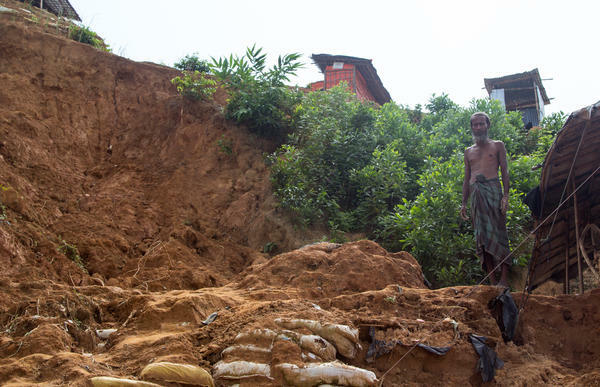 Jabin says another challenge is that the Rohingya never faced landslides in their villages at home, so the idea of an avalanche is foreign to them. "No matter how much we showed pictures, how much we gave examples of how [landslides] happen, they were adamant that 'No, this is not a reality. This is not going to happen to us,'" she says with an air of exasperation. "And so that was also an added struggle for us to convince them." Roshedha Begum was among those who were finally persuaded and moved to the Camp 4 Extension. She moved into her shelter earlier this month, but says she doesn't like being on the outer edge of this mega-camp. She says it's a long walk now to get to the mosque or the health clinic. Officials with the U.N. say that more mosques and other facilities will be built as these new neighborhoods expand. Talking about the difficulties in the camp, Begum gets angry. And then it becomes clear that it's not the distance to the mosque or how long it takes to get to the market that's bothering her. She's upset that she is here at all. She's mad, she says, that the government in Myanmar succeeded in driving the Rohingya from their villages. "In the violence, we lost our country," she says. Then she pulls out her phone. On it, she has a photograph of her son's dead body. He was killed, she says, by a Myanmar soldier in the attacks last year. At that point, her anger turns to tears.